When thinking of developing agriculture for the world, for animals or people, the Sahara Desert is not the first place that comes to mind. But it’s precisely here that such development is perhaps the most needed, and the answer lies in hydroponics. According to the Food and Agriculture Organization of the United Nations (FAO), the prevalence of undernourishment in Africa rose from 20.8 percent in 2015 to 22.7 percent in 2016, affecting 224 million people on the continent. In the refugee camps of Western Sahara, which shelter more than 173,000 people who fled the disputed territory 35 years ago, the figures are more alarming: the malnutrition rate is as high as 40 percent, affecting mostly children, according to the Red Crescent. 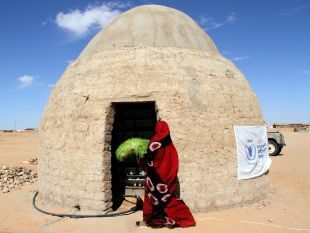 The United Nations World Food Program (WFP) is tackling the problem by setting up fodder production units in the Sahrawi refugee camps in Tindouf, southwestern Algeria - that rely on hydroponic agriculture, which means the plants are grown on a naturally inert material such as sand. Hydroponics requires no fertilizer and enables the production of fresh fodder for animals in desert regions or areas where the soil quality is too poor for agriculture. All that's needed is water. It was a Sahrawi engineer, Taleb Brahim, who came up with the idea, and it was quickly adopted by the UN’s food aid agency, which provided the necessary funds to launch the initiative. Three hundred families living in the refugee camps are now beneficiaries of the project. Brahim, himself a resident of the camps, presented his idea, named “Growing in the desert,” at the WFP Innovation Accelerator boot camp in Munich in 2017, where it was selected as the jury’s first choice. 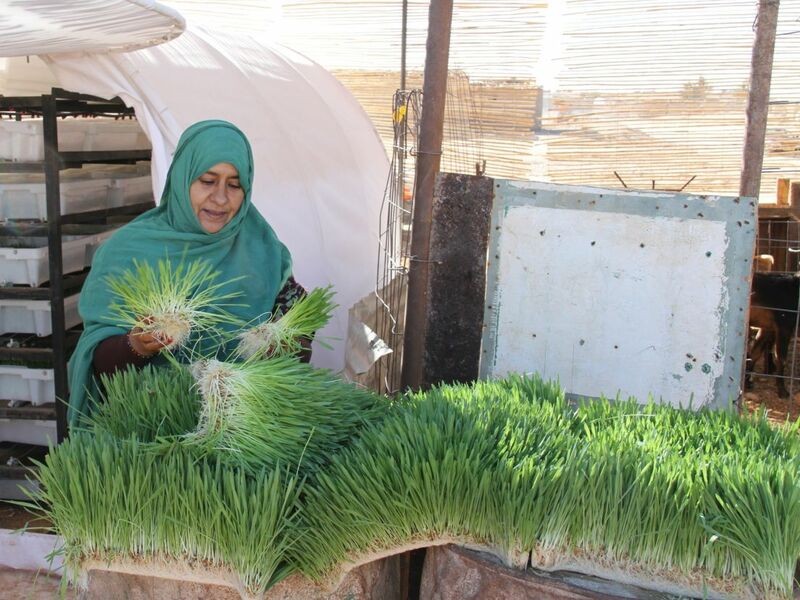 Using trays of local barley, the Sahrawi families who benefit from the program grow plants that, one week later, can be used to feed their livestock. To protect them from the heat, the trays are kept in containers, in greenhouses or in mud-brick constructions. The positive effects on the livestock are unmistakable: an improvement in milk production in terms of both quantity and quality, and a drastically reduced mortality rate of goat kids, according to a report by the United Nations in Algeria. “The WFP wants to improve the food security of households and ensure they have better access to meat and goat’s milk. We also aim to give them opportunities for job creation,” says Romain Sirois, WFP Representative in Algeria. The organization, which has signed a contract with the Algerian company Agro Solution, ordered the installation of units consisting of stacks of trays (containerized units), in addition to units made on site, in order to produce fodder in large quantities. “The containerized unit can produce up to 100 kilograms of green fodder per day, which is enough to feed around 20 goats, while the locally-made unit produces 60 kilograms,” Sirois explained. Around 50 smaller units, each capable of producing up to 15 kg of fodder per day (sufficient for five goats), were distributed to families during the pilot phase of the program, in partnership with the nonprofit organization Oxfam in 2017. “I was given a small unit that’s adequate for my five goats – a few trays and some barley – and some training. 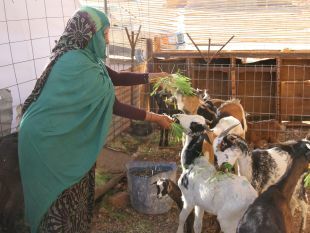 After about a week or 10 days, enough fodder grows and my goats are now healthier,” one of the Sahrawi women beneficiaries of the program said. Agro Solution is currently producing another 170 units, which should be operational by September. “By the end of this expansion phase, we should be reaching 220 families. But with a population of 173,600 refugees in five camps, there’s potential to further develop the project,” Sirois said. He explained that additional funding is required to carry out the entire expansion of the program – each family-sized unit costs $250 and each containerized unit costs $25,000. Among the donations the WFP has received to fund the project are those made by the German government, via the Munich Innovation Center, and the Canadian Embassy in Algiers. A large contribution from the United States will enable the next phase of the program to be launched. “We have managed to reduce costs, all the while maintaining a good level of production. We’re currently in discussion with Agro Solution about producing [family-sized] units that would be even cheaper, at 150 dollars per unit,” Sirois said. The project, which has the support of the Sahrawi people, might soon be reproduced in some Sahel countries. “We received a visit from a representative of Chad, and Oxfam is holding talks to replicate the initiative in Mali and Niger. It’s very significant for us – we are using our experience to enable other communities to benefit from the same technology,” the UN representative said.